We all have our reasons for staying in a job that we dislike. It is a natural, human tendency for us to remain in our comfort zones, fearing the unknown. But life is too short to stay in the same miserable place, not knowing what possibilities lie out there. Adulthood does not have to consist of a career that leaves you unsatisfied and unfulfilled. In every negative job situation, there is typically a breaking point that triggers the necessity to get out. Maybe you hit that breaking point long ago or have signs of work burn-out, but are finally taking the steps to research some ideas for the future. Wanting something new is not selfish! Forcing yourself to work in an environment that you dislike will only make you feel resentful of the time you wasted. 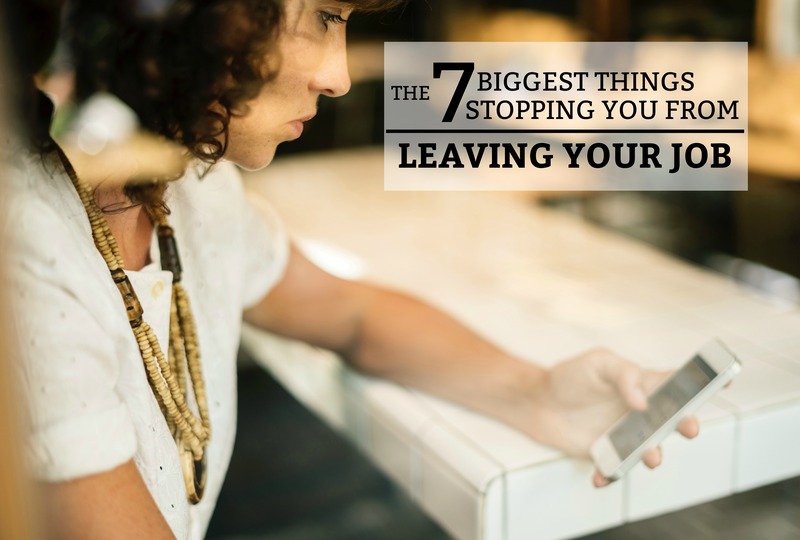 Perhaps you are living paycheck to paycheck and believe you can’t afford to leave. Maybe you feel like you have a decent salary at your current job and don’t want to risk taking a pay decrease. Whatever your current situation is, there is always a solution. Spend a few hours number crunching and going over your finances. Do you have any money in savings? Do you need to grow your emergency fund? What areas of spending can you cut back on? I believe this is the most important factor in pursuing any life goal – mindset. If you don’t believe you can accomplish something, you never will. If you are a chronic doubter, you need to shift your mindset and increase your self-confidence. Possibilities do not come your way and dreams do not fulfill themselves – you need to take action and start researching possible job changes. This was a big problem for me. I loved my coworkers – they were the people who went through the daily grind with me. I knew that if I left my job, they would be left with my exorbitant workload on top of theirs. The more I thought about it, the more I convinced myself that I just couldn’t do it to them. But I had to realize that we were all the same: we all had a choice to stay or leave. I couldn’t risk my life’s happiness regardless of how much I liked those people. In the end, I gave a 6-week notice, so I could prepare the team for my departure. Your coworkers may be good friends, but don’t let your sentiments hold you back from pursuing a better life. They will understand! “What if people perceive me as a quitter?” “People will think I am CRAZY for leaving this job!” “Maybe I am ungrateful and need to get a fresh perspective on things!” “If I leave now, I will have wasted all the work that I put in to get to the place I am now!” Maybe these things are true – you are the only person who can answer these questions. In the past, I had these exact doubts! I was miserable, but I did not want anyone to think less of me. I did not want to waste the work I had put in to get promotions and impress management. LET IT GO! Focus on what is best for you and your goals. Be confident and stay focused – if you want something new in life, go out there and find it! It could be a friend, partner, spouse, child, family member, or coworker. You need to surround yourself with a group of people that support your dreams and goals. They may not understand why you want to make a change, but they should support that you want to better yourself and follow your dreams. TIP: When you make a job/career change, you do not need to tell everyone in your social circle. When I stepped out to pursue my dream of entrepreneurship, the only person who knew the details was my husband. I told my family and friends the minimum amount of information because I was not 100% sure of the direction I wanted to take. This greatly minimized the amount of questions I had to answer. There is nothing worse than feeling like you are going to fail at something – especially if you put your finances and reputation on the line. Although this is linked directly with #2 (Your Mindset), fear of failure is something that is almost impossible to escape. But you can turn this into your biggest driving force towards success. Harness your fear and let it push you towards accomplishing a goal instead of preventing your growth. Take the steps to increase your confidence! Over time, your fear will turn to self-confidence as you realize that you are capable of much more than you thought. There is a big difference between dreaming of change, and actually pursuing it. When you have a dream or goal, the first step is always doing some research. If you have not utilized the internet to research your goal, you need to get with it! With hundreds of articles and websites on every topic you can think of, why are you not taking the simple step of reading them? Go online or your local book shop/library and start reading. If you have a goal, chances are someone has already gone through it. Learning from others’ wisdom will help you avoid mistakes and pursue a dream in the safest way possible. No matter where you are on your path, there is always something you can do to improve your current situation. Don’t let anything or anyone stand in the way of you pursuing a dream. Sometimes, people or circumstances are sent to you to help you gain focus or change your perspective. But don’t completely abandon your goal of bettering yourself and your situation. If your situation makes you miserable, take the steps to successfully leave your job.